About a year ago, Google added a new rich snippet for prayer times, so when you searched Google for prayer times in a specific location, Google would return some responses depending on the search results marked up with those prayer times. Of course, Jewish and Islamic prayer times differ, so technically, you would probably want to qualify your search for something like [jewish prayer times new york]. 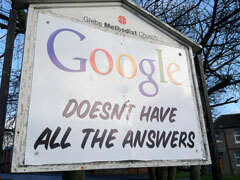 But those prayer time rich snippets seem to have been discontinued by Google. I spent some time marking up the sites using the Synagogue software my company built and it was a waste of time I guess. Going to the rich snippet prayer times support page returns a page not found error. I emailed Google for a response on why this was removed but I have yet to hear back. Users can still search for prayer times on Google and find results from local sites, but we weren't seeing much implementation of prayer times rich snippets, so we've removed it (apologies to webmasters who took some time to implement it) and are focusing our resources on developing different kinds of structured information in rich snippets. Image credit fridgeuk on Flickr. Previous story: Wikipedia Links Can Backfire?